Lt. Col. Kathy Froehling says her office is working to build a common architecture for sharing biometric data among military agencies. 'We need more unmanned aerial vehicles at all echelons,' says Lynn Schnurr, who is director of information management for the Army's Intelligence Directorate. It's difficult for soldiers and Marines in Iraq to tell friendly residents from insurgents and terrorists, but biometric devices are helping them. Troops and intelligence analysts are using biometrics to hire and maintain an Iraqi workforce, protect military bases and monitor inmates at detention centers. About 100 fingerprint and iris scanners are in use at bases in Iraq, and the number grows steadily as more units are requested. The devices help troops verify employees and identify prisoners' past crimes and affiliations. 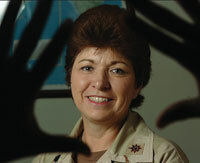 The use of biometrics in Iraq marks the first time such products have been used in war or postwar efforts, said Army Lt. Col. Kathy Froehling, special assistant to the joint intelligence systems chief at Central Command in Florida. 'This is something we just recently started using back in November when different units on their own began requesting the technology for force protection,' Froehling said. The devices have helped base commanders determine whether unauthorized Iraqis are trying to get into a post. One Iraqi contract employee working for the Army recently placed his finger on a print scanner to verify his identity for a payroll check. Later that day, his brother, posing as the employee, came by to pick up the check. He failed the fingerprint scan and walked off empty-handed. The devices also help troops monitor personnel who have been kicked off military bases elsewhere in the world. Eventually, military police officers patrolling dangerous areas worldwide will carry handheld biometric devices to take readings as they interview people on the streets. That will ease the work of the MPs as well as soldiers investigating incidents such as bomb attacks, which involve identifying many different witnesses. To monitor new enrollments at detention centers, the military is using the Biometric Automated Tool Kit, developed by the Army's Battle Command Battle Laboratory at Fort Huachuca, Ariz. The kit has a portable identification processing system, complete with handheld iris scanner, notebook computer, digital camera and fingerprint reader. Froehling said her office is working with the battle lab to finish the blueprint for a common architecture to share biometric data among military agencies. That data now resides in disparate databases. 'We are trying to get that architecture in place so the servers that hold the data can talk to all these outlying systems and we can update the databases with new information,' Froehling said. The Army is also using battlefield record management systems such as the Document Exploitation System, which lets intelligence analysts sift through millions of pages of documents captured by coalition forces. And the service is fielding more sensors in Iraq so it can constantly monitor ground troops, Schnurr said. 'This is absolutely critical,' she said. 'We have fielded some new platforms, and we need more unmanned aerial vehicles at all echelons. We need the ability to take new technologies' and insert them into the new platforms.